Integrate your eBay account(s) with Brightpearl and manage your listings, inventory, prices, orders and shipments in the same place as for your other sales channels. Brightpearl is connected directly to your eBay seller account. If you have multiple eBay accounts they are all connected separately and managed as separate sales channels. The app is only installed once. eBay listings must be connected to a product in Brightpearl to begin managing the listing content, duration, availability and price, and to be added and allocated onto downloaded orders. Listings already in eBay on connection, or created directly in eBay after connection, will download into Brightpearl. They can be viewed on the eBay channel listing report and either manually connected to products or automatically connected to products with matching SKUs. Products in Brightpearl can also be used to upload new listings to eBay. These listings will be managed by Brightpearl unless they are manually disconnected. Once Brightpearl is connected and managing a listing, the listing can be edited, ended and relisted from Brightpearl. Note : Auction listings are not fully supported. We recommend that auction listings are not used with Brightpearl. Once a listing is connected to a product, Brightpearl will send the on-hand inventory quantity to the listing. Inventory updates are made only when the on-hand inventory level in Brightpearl changes. Brightpearl allows you to set minimum and maximum level for your eBay listings to ensure your listing never shows more or less than your chosen limits. Multiple price lists of various currencies can be used with eBay in order to manage both domestic and international listings. Once a listing is connected to a product, Brightpearl will upload any changes to the price made in Brightpearl. New orders received via your eBay seller account will automatically download into Brightpearl. Where the listed item purchased is connected to a Brightpearl product, the product will be added to the order and the inventory allocated. Remember that allocation changes the on-hand inventory level and will therefore trigger an update to the listing and your other sales channels. There is an option to only download paid orders. This means that Brightpearl will capture only the most up to date information on the order and download the final version of items into a single order. This will help to ensure items for the same customer are shipped together where they have committed to buy multiple items separately. Payments made against orders via PayPal will download into Brightpearl. The payment is downloaded once the order is marked as payment complete in eBay. Payments made using any other method will not download and are handled manually by marking the order as paid both in eBay and in Brightpearl. If the order is paid upfront in eBay, it will download and be marked as paid in Brightpearl - all in one go. 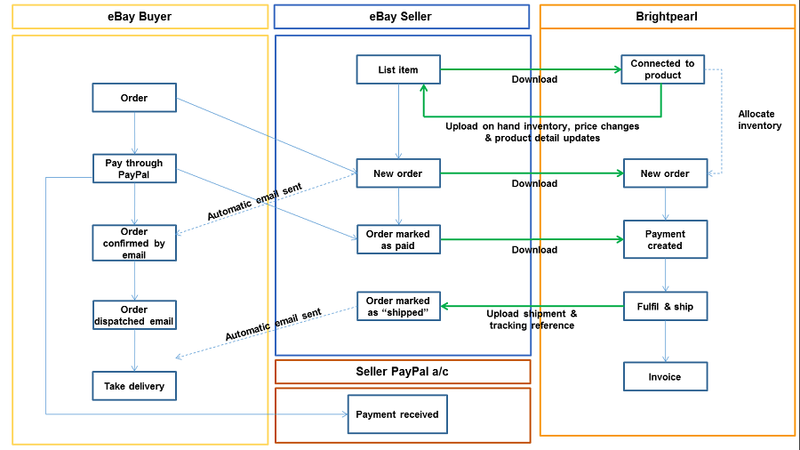 If an order downloads as unpaid (committed sales) and then the buyer checks out and pays via PayPal, we will download the payment and mark the existing order as paid - as long as the item has not been merged into a combined eBay order. We're also able to go back 7 days and download the payments for any unpaid orders in Brightpearl. When payments are created it marks the order as paid and creates the sales receipt accounting. PayPal and eBay fees are not managed by the integration and will need to be manually accounted for in Brightpearl. If you are using the accounting module, this means that a manual adjustment for PayPal fees needs to be entered . If you are using our other sales channels you are probably already doing this, so now you will just need to include the fees for eBay sales too. If you do not currently do this you will need to check your PayPal account to see how much PayPal charged in fees and then enter a manual journal to reduce the bank account and increase your PayPal fees expense account. You can do this as frequently as you like, such as weekly or monthly. Brightpearl will assign and apply tax codes to downloaded orders based on rules built into the integration. These automatically applied tax codes can be edited directly within the Brightpearl order record. Every order in Brightpearl is created against a customer record. A record will be created for new customers. If a customer record with the same email address already exists in Brightpearl the order will be created against it, and no new record is created. A new eBay customer record will be created in Brightpearl using buyer first and last name provided by eBay, and their eBay username will be recorded in the aliases section of their record. Cancellations, refunds and returns are not managed by the integration. The customer will need to be refunded via PayPal or as instructed by eBay, and the order cloned to a sales credit in Brightpearl to record the return of goods, refund and changes to revenue/income. International listings can be created on eBay in two ways, both of which can be managed by Brightpearl. Passive listing is where a single eBay listing is created and offers international shipping. In this case a listing is created on your domestic site using your base currency price list. eBay will then convert this price depending on which shipping locations are offered and they will make the item searchable on the relevant eBay sites. Active listing is where listings are created specifically for a particular international eBay site. There can be multiple listings for the same product, each for a different site. In this case Brightpearl will require a price list of each currency you are listing in, and Brightpearl will manage those prices on eBay. Foreign currency sales will download into Brightpearl in the currency in which the order was placed and then be converted into your base currency for accounting, using your system exchange rate. The payment will be converted using the same exchange rate. If you are fulfilling eBay orders using FBA you can still connect your eBay account with Brightpearl. You should use a warehouse in Brightpearl to record the items and inventory managed by Amazon, and assign this warehouse to your eBay channel - this warehouse will also be used on your Amazon channel. When an order downloads from eBay it will allocate the stock from the FBA warehouse. Brightpearl will not push the order to Amazon - this will need to be done manually by entering a fulfilment order within your Amazon seller account. However, there are applications which can automate this for you and which will also connect to Brightpearl, such as ShipStation. Although you won’t need to actually ship the items, the order must be marked as shipped in Brightpearl to trigger the update to eBay. Shipments from the FBA warehouse can be filtered out from any other shipments from your main warehouse to ensure they are not printed, pick and packed. As of version 4.90, Brightpearl supports the eBay Global Shipping Programme (GSP).